Bagozzi, RP, Yi, Y, (1988), On the evaluation of structural equation model, J Acad Mark Sci, 16(1), p74-94. Choi, SM, Kim, Y, (2005), Antecedents of green purchase behavior: An examination of collectivism, environmental concern, and PCE, Adv Consum Res, 32, p592-599. Cone Inc., (2013), Global CSR report, http://www.conecomm.com/2013-global-csr-study-release Accessed March 2, 2018. Court, D, Dave, E, Mulder, S, Vetvik, OJ, (2009), The consumer decision journey, McKinsey Quarterly, June, 2009, https://www.mckinsey.com/business-functions/marketing-and-sales/our-insights/the-consumer-decision-journey Accessed February 21, 2018. Engel, JF, Blackwell, RE, Miniard, PW, (1990), Consumer Behavior, 6th ed., Dryden Press, Chicago, USA, p4. Environmental Leader, (2008), Dunkin' donuts opens its first LEED restaurant, Energy & Environmental News for Business, https://www.environmentalleader.com/2008/10/dunkin-donuts-opens-its-first-leed-restaurant/ Accessed January 2, 2018. Green Restaurant Association, (2010), Consumer’s green dining habits. Green Restaurant Association May 2010 Project, 3258, https://www.slideshare.net/2010GRA/consumers-green-dining-habits Accessed February 21, 2018. Green Restaurant Association, (2012), Green restaurant 4.0 standards, http://www.dinegreen.com Accessed December 15, 2017. Han, JY, Yoon, JY, (2013), A study on consumers’ green practices and exploration of significant factors in green restaurants, J Tour Leus Res, 25(2), p323-342. Han, JY, Yoon, JY, (2014), Developing management criteria for Korean green restaurants: A modified Delphi method, J Foodservice Manage Soc Korea, 17(3), p237-260. Kim, YJ, Kim, DJ, (2012), Consumers’ intention to select eco-friendly restaurants by adopting extended theory of reasoned action, Foodservice Ind J, 8(2), p45-62. Lee, SH, Kim, MY, Park, SK, (2007), The study of the consumers’ attitudes toward fashion counterfeit and brand equity - Focusing on mediate role of brand attachment, J Consum Cult, 10(3), p87-104. Liou, YW, Namkung, Y, (2012), The effects of restaurant green practices on perceived quality, image and behavioral intention, Korean J Hosp Admin, 21(2), p113-130. Lorenzini, B, (1994), The green restaurant, part II: Systems and service, Restaurant & Institutions, 104(11), p119-136. National Council of the Green Consumers Network in Korea, (2010), 10 green ways to reduce CO2, http://www.gcn.or.kr/gcnbbs/goodguide.html Accessed March 1, 2018. National Restaurant Association, (2011), 2011 Restaurant Industry Fact Sheet, Washington DC, http://www.restaurant.org Accessed March 1, 2018. Nielsen, B, (2004), Dining green: A Guide to Creating Environmentally Sustainable Restaurants and Kitchens, Green Restaurant Association, Sharon, Mass, p1-28. Salant, P, Dillman, DA, (1994), How to Conduct Your Own Survey, John Wiley & Sons Inc, New York, NY, p53-72. 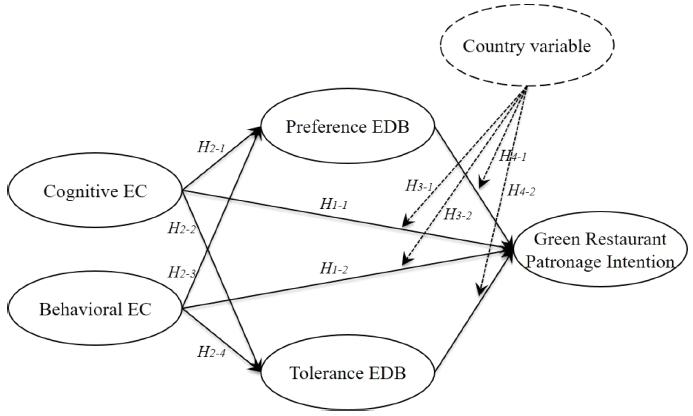 Schultz, P, Zelezny, L, (1999), Values as predictors of environmental attitudes: Evidence for consistency across 14 countries, J Enviro Psychol, 19(3), p255-265. Takacs-Santa, A, (2007), Barriers to environmental concern, Human Ecol Rev, 14(1), p26-38. Urbach, N, Ahlemann, F, (2010), Structural equation modeling in information systems research using partial least squares, J Inf Technol Theory Appl, 11(2), p5-40. Won, JH, Chung, JE, (2015), The segmentation of single-person households based on Sheth’s theory of consumption value, J Consum Stud, 26(1), p73-99.